Community gardens are a great resource, especially if you have no growing space or like to sprout socially while you tend your plants. My friend Barb lived in New York City near Columbia University for years. She and her young daughter had relocated from New Hampshire, and they missed growing things. She found a neighborhood program that assigned residents small plots in unexpected places. Theirs was a four by four space around a tree off Amsterdam Ave. Every day they carted a gallon of water, a bucket and trowel around the block to tend their little green space, greeting shopkeepers along the route. My hometown of Great Neck, New York, was a pioneer in the 1970s in setting aside a large tract of land for a neighborhood garden. Ours was behind the defunct elementary school that my mom went to in the 1930s. I had my own garden at my house, but I worked in the town park next to the garden. Every day I watched people young and old exchange gossip and gardening tips as they worked their small plots. It provided a sense of community along with tomatoes, eggplants and peppers. St. Augustine, Florida, where I live now, has a community garden thanks to the efforts of many volunteers and the support of local agencies and businesses. It sits by a community park that also hosts the weekly farmers market and is a hubbub of social activity. You can read more about the Lincolnville Community Garden and CitySprout, which supports local gardening, here and here. We travelled a bit this summer to visit potential colleges for our daughter. Community gardens popped up in the most unexpected places and I snapped shots whenever I could. In West Philadelphia, the Summer Winter Garden is nestled between the University of Pennsylvania and Drexel. It’s named for two nearby streets, not the seasons. The main path cuts the corner through the city block, so that students and residents stroll through regularly. In Durham, North Carolina, the Mosaic Community Garden sits on a small hillside beside Duke University’s Center for Documentary Studies. It’s a collaboration between the center and Charlie Thompson’s Politics of Food course. See here for an interview with Thompson that talks about the garden in the last question. In a big city setting, GROWNYC has created or rejuvenated 60 community gardens in New York City. 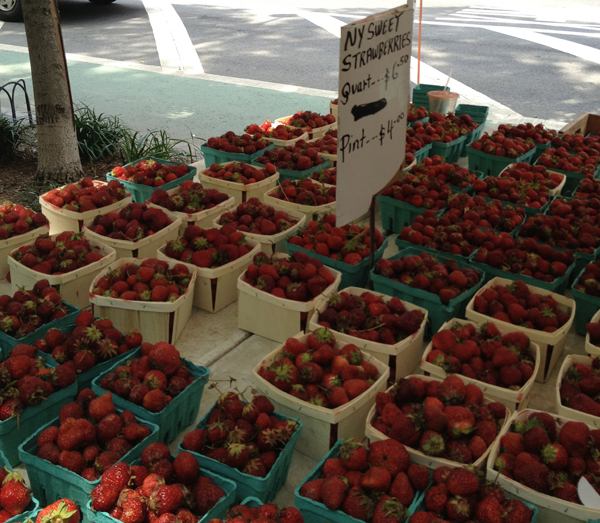 It also sponsors 68 farmers markets in the city’s five boroughs. Speaking of farmers markets, they are the best friend of anyone trying to live simply, on a budget and on the move. From the GROWNYC’s 79th Street Greenmarket in Manhattan to the Watauga County Farmer’s Market in Boone, North Carolina, to three different farmers markets in St. Augustine, in the last year I’ve bought veggies, fruit, cheese, bread, fresh pasta, plants, flowers and garlic vinegar. I’ve chatted with friends at home and found an instant community on the road. You can retire tiny and travel and still find fresh, local ingredients just about anywhere. And you probably will make some new friends in the process.